BuyShop is a premium, real transformer WordPress WooCommerce theme. It will allow you to create structure according to your needs and requirements. BuyShop WooCommerce WP theme will satisfy all your needs that you are requiring and expecting from eCommerce solution. Real Transformer which will allow to control every pixel. Unlimited colours, backgrounds, textures, fonts etc. Ajax add to cart, add to wishlist/compare, toolbar paging/sort. You can enable/disable this feature. 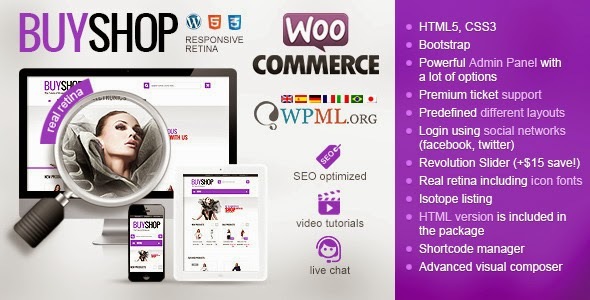 Item Reviewed: BuyShop Responsive WooCommerce WordPress Theme 9 out of 10 based on 10 ratings. 9 user reviews.